One of our greatest fears is rejection. We fear embarrassment. We fear what people will think. What if they don’t approve of me? What if they laugh at me? 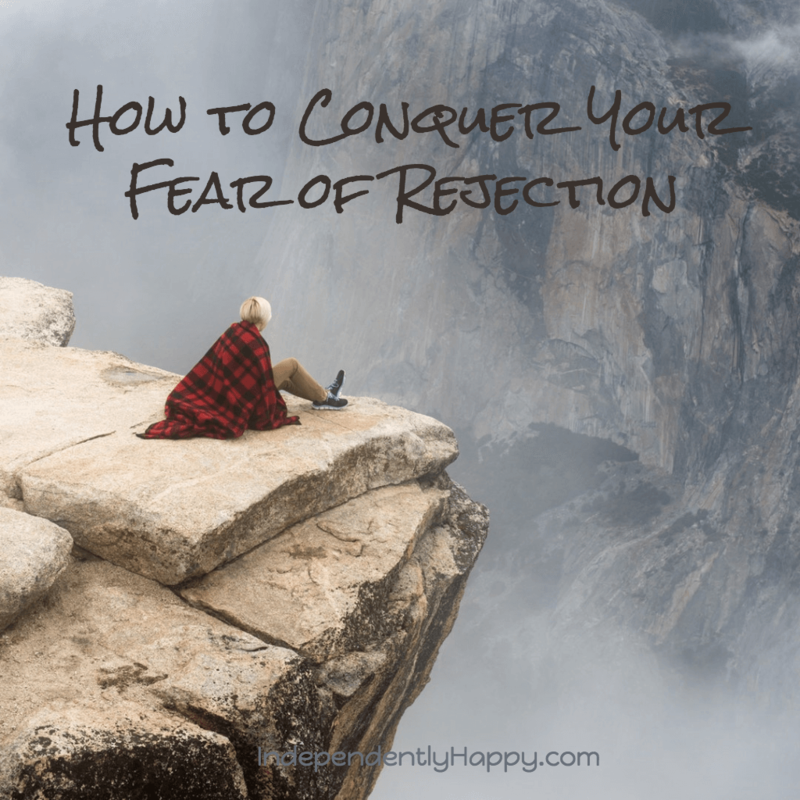 That fear is debilitating, so you need to know how to conquer your fear of rejection. Awesome pic by Connor McSheffrey on unsplash.com! What if I look dumb, or look like I support the wrong side? When they find out we disagree, they might reject me. If I don’t do what they do, they’ll think I’m different. 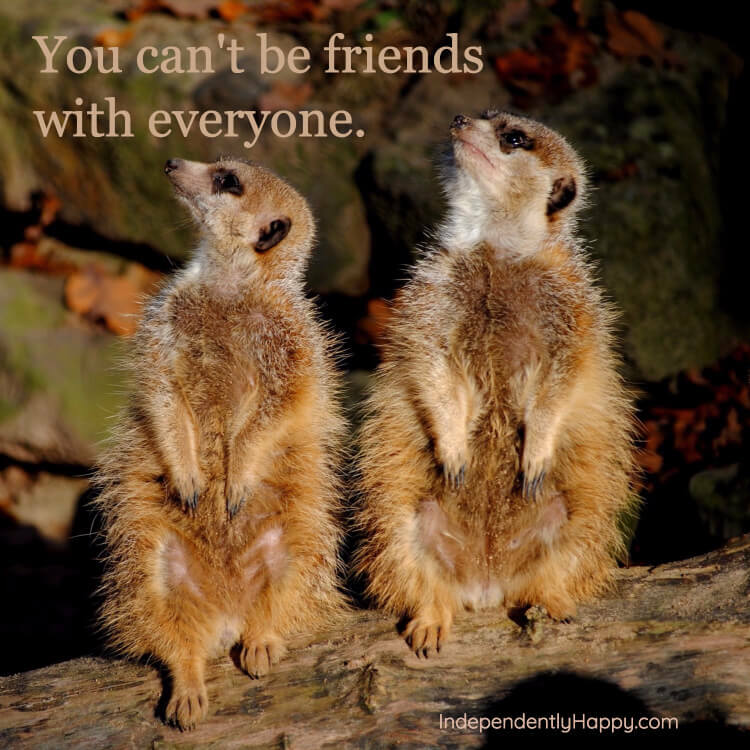 You can’t be friends with everyone. It is impossible. About a third are in this party. Another third are in that party. Another third just bounces back and forth based on who has the best ads or who’s had rough few years. And a third hate the other three thirds just for being thirds. My math may be a little off. Those are just estimates. No matter what your opinion is, about half the world will disagree with you. So pick a side. Here are 10 Reasons Why It’s Impossible To Please Everyone. It’s okay to have an opinion that others disagree with. Original thoughts are healthy for the brain. Your true friends will love you and stick by you no matter what crazy beliefs you hold. My friends stuck with me. Speaking of friends, you can’t be friends with everyone. There are some people you just won’t get along with. Is there anyone you don’t like to be around? Guess what. There are people in this world who don’t like to be around you. I was talking to a guy at work about a lady at work. I realize that. There are people who don’t like me because I refuse to let them see me in a bad mood. I’m not perfect at it, but I try my hardest to not let anyone see that they really piss me off sometimes–frequently, as a matter of fact, but I don’t want to give them the satisfaction. Which seems hypocritical now that I write it. I don’t want them to see me angry because I don’t want them to think they can get to me means I care what they think. So there are many who don’t like me because I’m happy all time. There are many who don’t like me because I don’t take things as seriously as they do. Even amongst my best friends, I’ve always done my own thing. 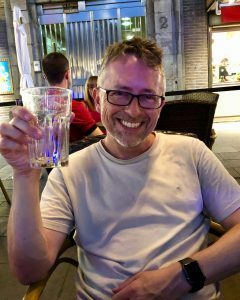 BTW, if you fear your work being rejected, check out my friend Frank’s article 7 Foolproof Ways Writers Can Stop Rejection From Stealing Their Dreams. First, You Will Be Rejected. Many will disagree with you, disapprove of you, and feel rubbed the wrong way by you. There will be some who dislike you for no particular reason. I was tutoring accounting students for community service in college. A friend later told me that some guy asked about me. He said the guy told him that he didn’t know what it was about me, but he just didn’t like me. I have no idea why. Nor do I have any idea why my friend found that so amusing. There I was, teaching people accounting for free, helping them pass their college classes, and that guy didn’t like me and didn’t know why. It is certain we’ll be rejected sooner or later. Maybe sooner. Certainly more than once. Don’t be scared. Download the free eBook version of my October posts about Fear! The second meaning of “Rejection is Certainty” is that now you know. No more uncertainty. One of our fears is uncertainty, not knowing. That’s probably why that guy didn’t like me. There was something he couldn’t figure out about me. It was uncertain. 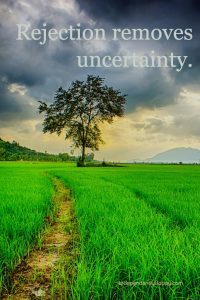 Uncertainty is disconcerting. There was no hating or hurting. He didn’t like the disconcerting feeling, so he didn’t like the source, aka, me. Rejection also removes the unknown. When rejected we know the answer. We don’t have to wait, wonder and worry. We get the NO right away and move on to the next story. Rejection makes decisions for us. It reduces options and hesitations which are mostly distractions and procrastination. Rejection isn’t a failure. It’s affirming a path (an option) that doesn’t work. Rejection is decision. An unsubscriber to your mailing list is doing you a favor, weeding out someone who won’t be a raving fan. Who wants wishy-washy fans? That would make you Train or Collective Soul when what you want to be is Foo Fighters or U2. Get rejected early. Know sooner. Weed out the suspects and the wallflowers (another great band, by the way) and invest your time in your biggest supporters. 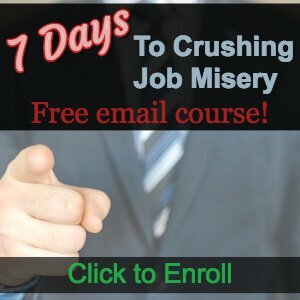 Do you struggle with the fear of rejection? Who do you fear will reject you? And would it really be so bad? Please tell us in the comments below.